Select the Web Hosting Product you wish to add Two-step Verification to. 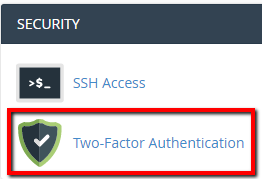 Once logged in to cPanel, click on Two-Factor Authentication, in the Security section. If no device is setup, it will display a yellow message indicating this. Proceed to click on Set Up Two-Factor Authentication to start the setup. Once installed, please use the app to Scan the QR code, presented in Step 1 on the setup page. 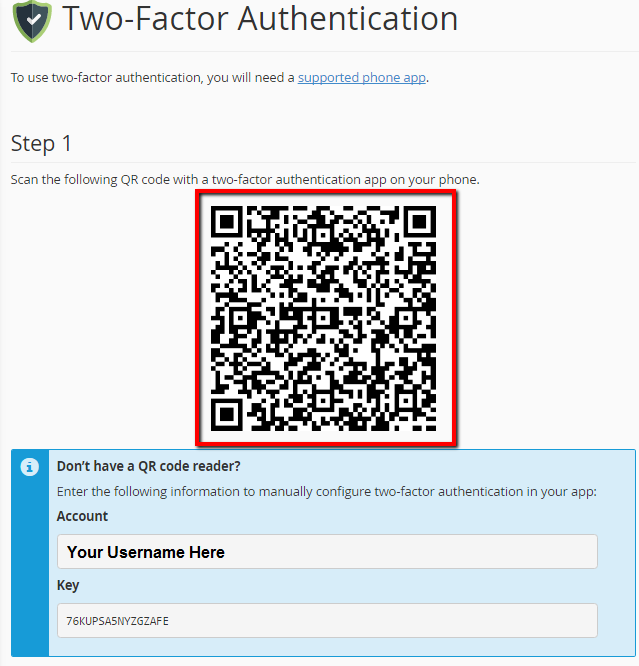 If you do not have a QR reader, or have any issues scanning it then you can manually enter the Account information and Key, outlined in the blue information box below the code. Click Go Back, and it will now ask you to actually use your 6-digit code to verify your cPanel Credentials. Enter your code and click Continue. Note: Be sure to have the Authenticator app handy at all times when logging into your hosting account as it will provide you with an unique security code each time to use. There are now backup codes if youlose access and we recommend you generate and save these. Note: Please be advised that this feature will not work when accessing your hosting via a FTP client.